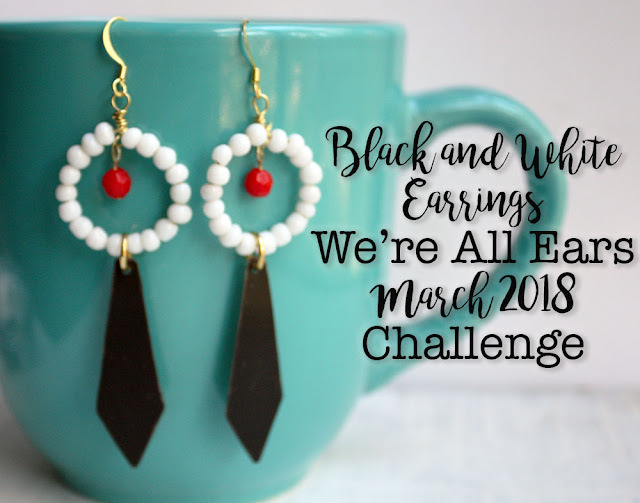 The We're All Ears Challenge this month from Erin at Earrings Everyday is to create earrings that are black and white earrings with maybe one other color. Doesn't sound too hard, until you try! Ha!! I was able to complete a sole pair. 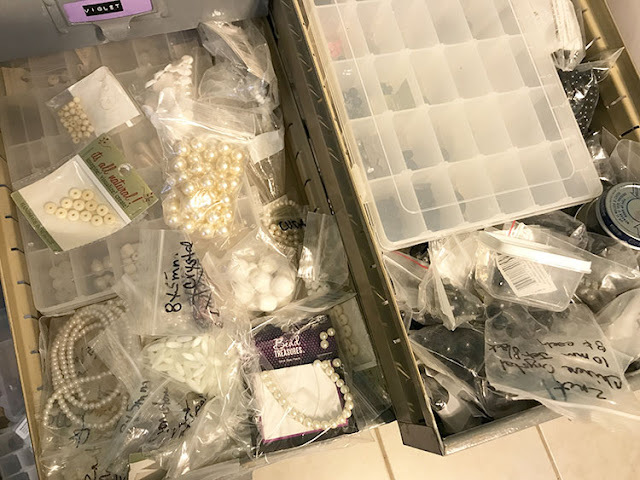 I started by rummaging through the black and white bead drawers in my bead cabinet. But, nothing there struck my fancy. Glancing frantically around the craft room, I uncovered some of the black tin that I had used for the Harvest Moon Challenge in October. That piqued my interest! 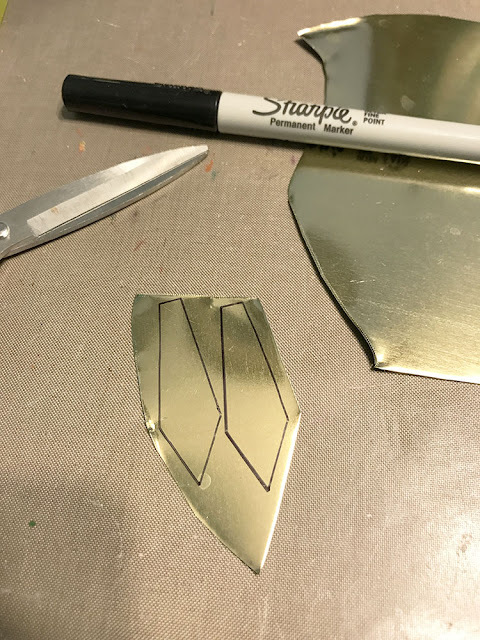 I traced the shape I wanted onto the backside of the tin, cut it out, filed and sanded the edges and back, and aged it with Novican Black patina. The hardest part was figuring out how to add the white. I tried several approaches like altering large plastic beads with alcohol ink. But, that wasn't the look I wanted to achieve. I thought I had hit upon something awesome with the idea of using a few of my bone skull beads. But, it just didn't work out exactly like I wanted. And, I wasn't sure it was completely my style. From there, I started thinking about Erin's mention of texture and considered more geometric shapes. I decided that large beaded rings above the reclaimed tin would definitely add some interest. I didn't want the rings to be empty, so a single red bead was added to hang from it. Making the wire loops above and in the hoops was the hardest part of the whole process. 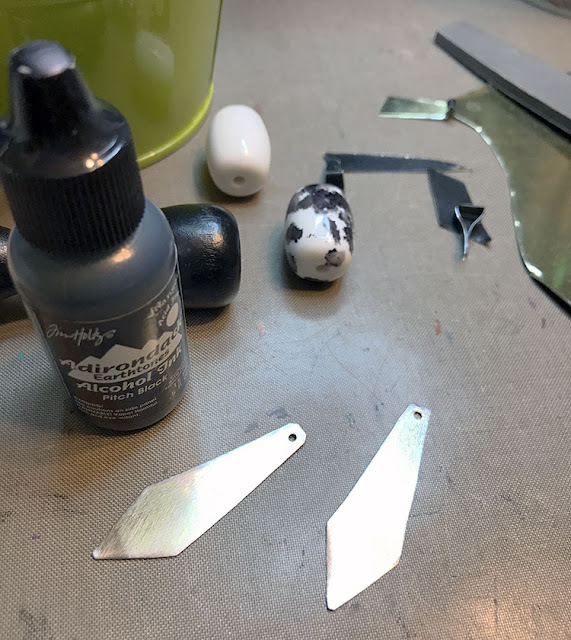 I have to admit that I really like the distressed backsides of the tin more than the front and will likely end up flipping them on the ear wires. Again, I only made one pair of earrings for the challenge, but they were enough of a struggle! Head over to Earrings Everyday: Pump Up the Contrast to see what everyone else created with the monochromatic prompt. 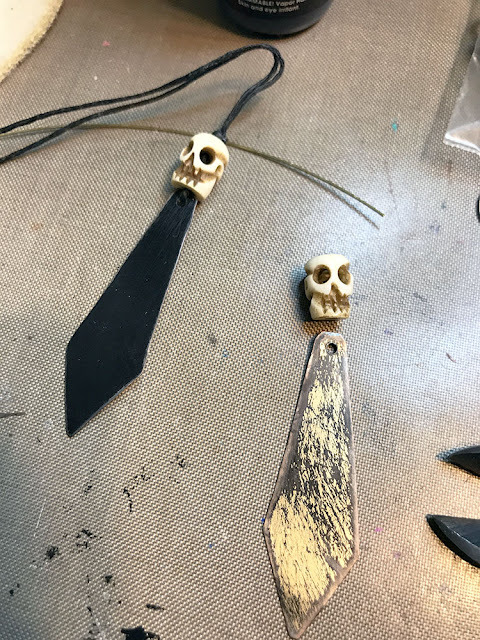 And, if you haven't made anything for it, the linky tool will be open for a week, so you've got time to play along too. Very pretty! I also like the distressed side of the tin too and think that would look very good. The shape of the black tin piece and the circle of white beads really play off each other well. And I agree that the distressed side of the tin is sooo interesting! Nice pop of red too! 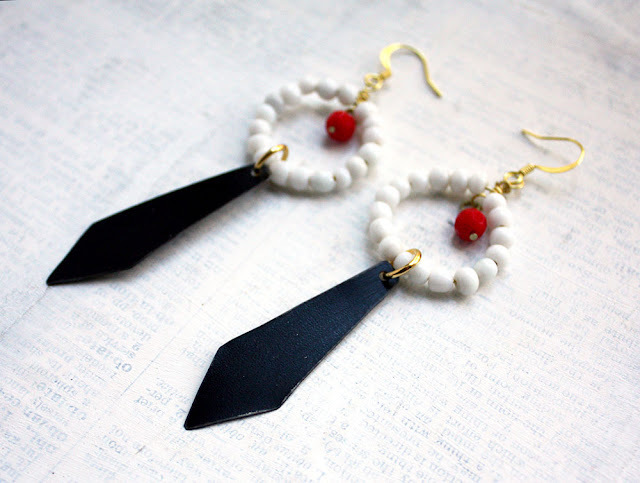 Great earrings! I like both the distressed and original pair. It is amazing how different they are. You really do a great job cutting tin. Thank you!! I'm still learning with the tin. My shapes aren't always the exact same size, but somehow I feel like that really adds to the handmade-ness of it. I hope it does anyway! Completely fabulous! 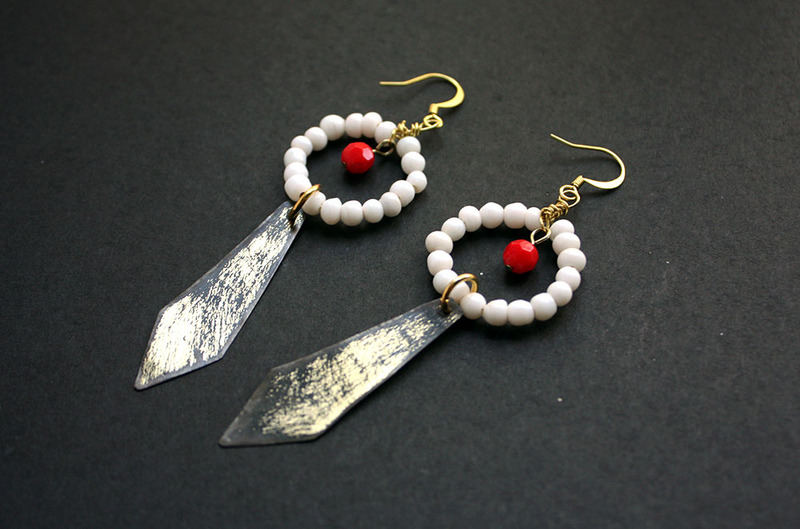 The red beads add just the right finishing touch. Oh goodness! Thank you!! I couldn't help myself. Red is so classic with black and white. I kept thinking of that old joke punchline, "Black and White and Read all over." HA! Terrific earrings. Really love the pop of red in that pair with the solid black piece. The red really warms up the black and white and in my eye makes each component stand out on their own and well as work well together. They are so fun looking! I could see you making a second pair with the distressed look as I really like those too! Really love these - just one pair, but that's all you needed! These are so fun! I think I agree about liking the distressed side a little better. I need to get brave and cut into some of the tins that I've collected. Sarajo, You should totally cut into your tins! I say this, but it took me forever as well, And, I've got quite the stockpile that I can't seem to let myself get to. But, it's so satisfying to make something from what you've been hoarding.